You might like one track to play a little quieter than the others, of you might have a sound effect you’d like to loop. Soundboard Studio has a whole choice of different settings that you can apply to each individual track. 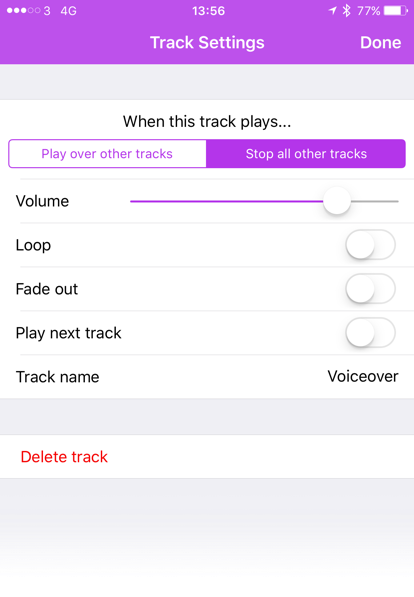 All you need to do, is tap-and-hold on one track, and you’ll see the track’s settings appear. Volume sets the volume level for this individual track, so you can really fine-tune the volume levels of each of your tracks. You can even change this setting while the track is playing, and the volume level will smoothly update. Loop will repeat your track forever until you stop it, or until it’s stopped by another track. Fade out applies to when you stop the track, so if you were to stop this track by tapping on it while it’s playing, it will smoothly fade out. 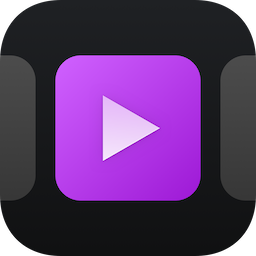 Play next track will automatically play the track immediately to the right of this track as soon as it’s finished. It will always play the track immediately to the right, so if you were to rearrange the tracks and place another track there, it will play that track. It’s worth knowing that this will only happen when this track finishes, and not if you stop it manually or if it’s stopped by another track.